Lists and Agendas and Diabetes. 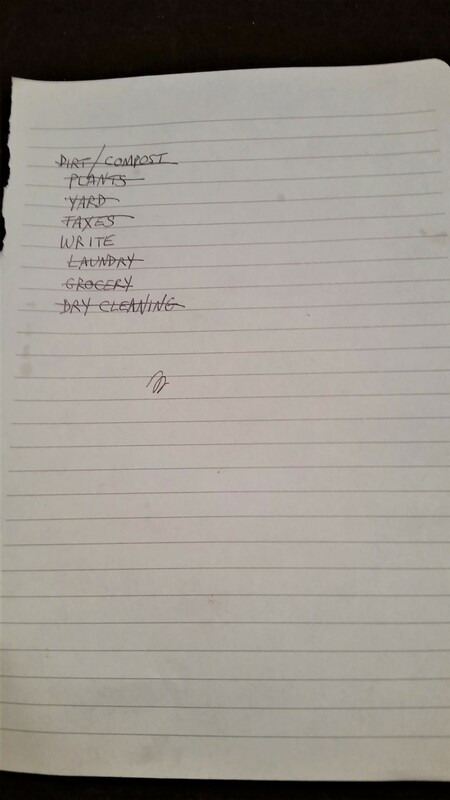 This is the list of tasks I wanted to accomplish last weekend. I know, taxes. I’m not usually a last-minute filer, but after getting them nearly completed a week ago, I needed to get some additional information together before I could send them out. The good thing about lists is that you can keep track of everything you want to do, or that you want to pick up at the grocery store. Plus, if you’re me, lists are valuable for not forgetting things. I am an unabashed list maker. That’s where diabetes is different. You can’t make a list for diabetes. You can make a list of prescriptions or supplies you need to refill. You can list the doctors you need to see this month. But when it comes to the everyday highs, lows, and in betweens of living with this thing on a never ending basis, there is simply no way to plan it out. I’ve seen the internet memes where people draw schematics to map out their decision processes when their BG is high or low. For many, doing a design like this is cathartic, and for people who don’t live with diabetes, it’s even enlightening. Speaking only for myself though, it’s neither. That’s not to say I think it’s useless. It’s a great tool. But it’s already been done, and I don’t think I could add much more to it, though it might be fun to try someday. Also, I remember that there are no schematics, no lists, that can’t get blown away at a moment’s notice, just because diabetes wants to screw with you that day. So while it’s funny to imagine all the twists and turns of our decision-making that happens, the truth is, we often don’t know what’s going to happen during the course of a day with diabetes. Remember when we read about the costs of diabetes beyond doctor visits and prescriptions? This is part of what they’re talking about. It’s where lives are changed and appointments are missed and meals are adjusted and where we all pay, all of us, everyone living with and not living with diabetes… it’s where all of us pay the cost of a condition that doesn’t care about lists and agendas. I accomplished everything on my weekend list. That’s the product of a plan, a focused effort, and a diabetes that actually cooperated for once. What galls me is that I have to rely on more than a plan and focused effort to get the job done. « Not exactly Spielberg, but A.I. has arrived. I find the pump and CGM do make diabetes more scheduled. But like you no matter how much diabetes is scheduled, it misbehaves, a more.